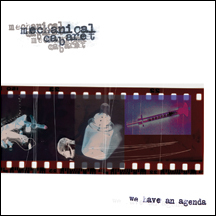 We are proud to announce a Limited Edition reissue of Mechanical Cabaret's sold out debut release, We Have An Agenda. Initially released as a 12 track album in June of 2002, the WTII version features new packaging, a remastered version of the original album plus 6 bonus tracks. The bonus tracks include two demo songs, three previously unreleased tracks and the 12" version of the mega club hit, See Her Smile. Mechanical Cabaret mixes a little bit of punk with glamor pop and electronics. This Limited Edition version will go fast.